For three years Speaker Christine Quinn held the line in the NY City Council on paid sick leave, citing the ailing NYC economy. All of her mayoral opponents piled on against her at a meeting she was unable to attend. Then she pushed through legislation quickly and efficiently. The compromise that was reached will give paid sick leave to one million New York City service workers that didn't have it. For those who think she gave away too much, I say - five days a year, only for companies employing at least 20 people (15 people starting in 2015)? That is not too much. Larger companies and governments routinely allow a day a month for the first year and 15 paid sick days after the first year. For those who think workers deserve better - of course they do. But New Jersey has zero sick days required of anyone and Connecticut requires nothing of any company hiring fewer than 50 people. The principle that is preoccupying the Supreme Court on DOMA - not being too far ahead of public opinion - also applies to political leadership. Only about half of U.S. workers have earned sick days, mostly public-sector workers and employees of large companies. Fewer than one-third of workers are able to use an earned sick day to care for a sick child. Polls suggest that about four out of five Americans believe that paid sick days should be a basic worker’s right, guaranteed by the government. With this kind of public support, sick leave has become a battleground topic during the 2013 mayoral election. A law has been proposed in the City Council requiring compensated sick leave for any company employing five or more workers and Speaker Quinn is being pressured to act. One incentive for action is that there is a law requiring paid leave in Connecticut, effective in 2012. However, it is a very timid law, applying only to "service workers", working for employers with a payroll of 50 or more people. The New York City law would apply to employers of five or more people. The difference between the coverage of the two laws is huge. 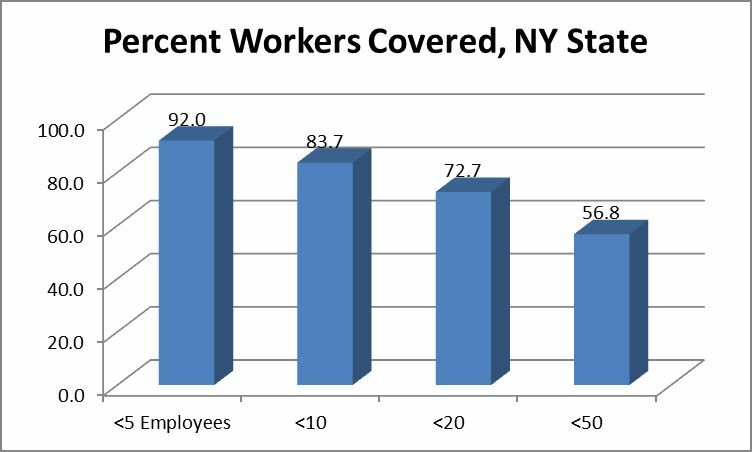 Using New York State data as a yardstick (see chart in previous post below), going from 50 employees to 5 employees adds 35 percent of workers. Excluding employers of fewer than 50 workers excludes 43 percent of all workers; excluding employers of fewer than 5 excludes 8 percent of workers. On the other side of New York City, New Jersey has no state law requiring private-sector employers to provide employees with paid or unpaid sick leave. Larger employers tend to provide it, and the State of New Jersey courts enforce such agreements if written into contracts or employee handbooks. But nearly half of workers in New Jersey (cited range of 1.2 to1.5 million workers) do not have the right to a single earned sick day. By not having earned sick days, these workers are more likely to go to work sick, putting the health of their co-workers and public at risk. Public-sector employees, meanwhile, receive 15 days' paid sick leave each year after the first year and may accumulate sick leave from year to year, with no limitations. We conclude that the Legislature had the authority to modify terms and conditions for future contracts for public employment in a manner that did not raise constitutional concerns. Most large firms already provide it, so it really is a small business issue. And most small businesses either can't afford to do it or don't have enough people to cover shifts that need to be covered or perform duties that need to be done. Small companies also tend to be more flexible on these matters, so not providing paid sick days doesn't mean they don't accommodate employees when they're sick.